All Custom Made Products do not include free shipping. Our Custom made one piece fire pit safety screens come in round, square or rectangle. They are available as a 100% Stainless Steel screen and frame or a lesser expensive version is a screen made carbon steel frame and stainless steel mesh. The screen pictured above is a 100% SS screen unpainted. We paint all of our screens. We operate on a plus or minus 1/2" tolerances on outside diameter measurements. The actual style used in the construction may change with out notice. The handles on smaller sizes are as pictured. Larger one piece screens we install two handles. The screen material we use is stainless steel and it's so heavy duty that we can only work it so much and we can only get the screen so tall based upon the diameter of the actual screen. If anyone else out there selling taller one piece screens it's because they aren't using heavy duty materials. This screen goes over a fire so it should be built right using the best materials. We sell a tool separately that helps lift the screen when it's hot. This will help when adding fire wood to the fire pit. Click here. 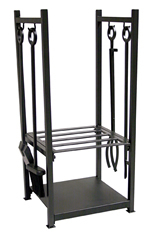 We have two different styles of fire pit safety screens. This model is a one piece safety screen. It doesn't not have any doors to open to add more fire wood but it's less expensive. It's an excellent choice to replace burned out screens that you may have gotten when you bought an out of the box fire pit. These fire pit safety screens are made of stainless steel mesh and 3/16 x 1" solid flat steel for the frame. These are very well made using the best materials for the money. 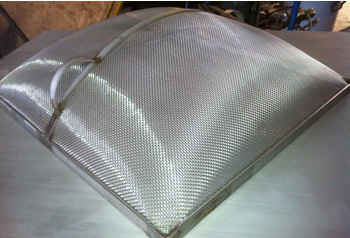 We use stainless steel mesh because this is the weak link in fire pit screens. The screens don't burn out they rust out and fall apart. Our screens don't do that therefore they should last many years. What size fire pit screen do you need? If this is a replacement screen measure the outside diameter of your old screen and order that size. If you are putting this on a built in firepit measure the inside of your fire pit and add 4". We suggest that when you order then screen ask for an extra can of special heat resistant paint $20 extra. This is a steel product that your putting into a fire. It will, not if, need touching up. It may also get a few scratches during shipping.